A passage noting the commission for Elizabeth Arden for a big flower painting. Photo: Shawn Miller, Library of Congress. WASHINGTON, DC.- The Library of Congress has acquired a trove of letters from American artist Georgia OKeeffe and her husband, the photographer and art promoter Alfred Stieglitz, shedding new light on art history as the correspondence is being made available to the public for the first time. The collection is a set of mostly handwritten letters dating from 1929 to 1947, totaling 157 items. OKeeffe and Stieglitz wrote the letters separately to their friend and artistic colleague, the filmmaker Henwar Rodakiewicz. 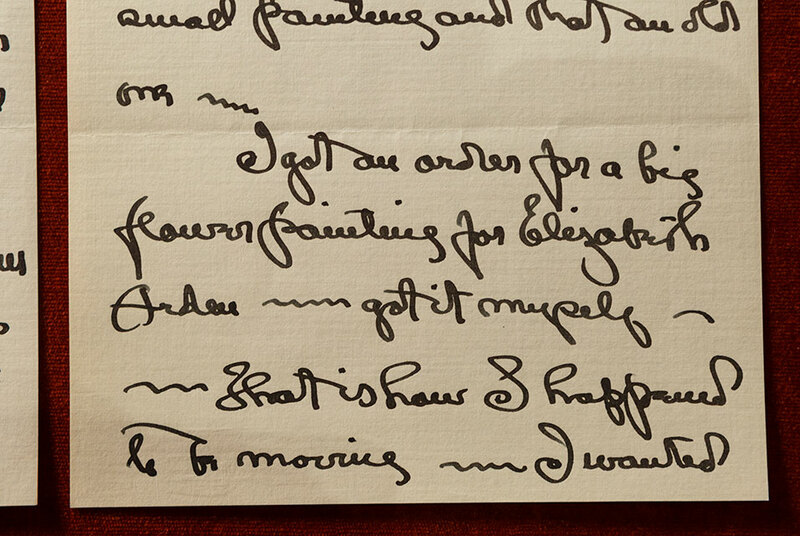 The letters were preserved in private hands for decades in Santa Fe, New Mexico, never before seen by the public. Now the collection is available to researchers in the Librarys Manuscript Division  in time to mark OKeeffes important role in art history during Womens History Month  after the letters were acquired through a purchase and gift agreement in late 2018. OKeeffes letters make up the bulk of the materials. She pens the correspondence in her distinctive calligraphy, writing notes from trains, from her apartment in New York City, from the Stieglitz family property at Lake George in New York and on letterhead from Ghost Ranch in New Mexico, where OKeefe kept a home and studio. A catalog record and finding aid are available online. Writing in poetic detail, OKeeffe described the sound of rain, the color of sunrises and mesas and how landscapes and bones around her inspired her to paint. In other writings, OKeeffe mentions her travels, the complexities of her life split between the East Coast and American West, her inner turmoil, joys and artistic triumphs. That painting is Jimson Weed, which now resides in the Indianapolis Museum of Art. Paintings of landscapes, bones and flowers would become some of OKeeffes best-known works in a career that would change the world of abstract art. At the same time, she became an icon and a trailblazer for women in art. The collection covers the last phase of Stieglitzs life  a time when OKeeffe was starting to forge her independence. They were often living apart. Stieglitzs letters document his failing health, his business matters and his ongoing commitment to his third and last gallery in Manhattan, An American Place, where he would promote the work of several groundbreaking modern artists. Stieglitz exhibited OKeeffes work in one-artist shows and displayed her drawings and paintings alongside works by Marsden Hartley, John Marin and Arthur Dove. As a photographer himself, Stieglitz played an instrumental role in placing photography into the realm of fine art and would be remembered as one of the nations most famous photographers. The collection of letters relates closely to a collection of Stieglitzs photography in the Librarys Prints and Photographs Division, which came to the Library from OKeeffe in 1949. The correspondence also complements letters in other archives, most notably Yale Universitys Beinecke Rare Book and Manuscript Library. Rodakiewicz proves to be an important character and confidant in the lives of OKeeffe and Stieglitz. OKeeffes letters to the younger filmmaker demonstrate they were emotionally close and thought of each other often, shedding light on the characters, passions and relationships of art history. The Librarys Manuscript Division also holds the papers of other artists and photographers, including Augustus Saint-Gaudens, F. Holland Day, Joseph Pennell, James McNeill Whistler and Frances Benjamin Johnston, among others.